I managed to snag a Wii Fit at Target the Sunday after Christmas for $89 mid-morning, no lines no waiting. They are at least $118 everywhere online I've seen. Anyway, it's so fun! I can't believe my kids actually enjoy virtual jogging. How odd. But it’s more fun when your “mii” (a cartoon version of yourself that you create from a staggering array of choices. I think there are 36 different eyebrow styles, with options to make them bigger/smaller, lighter/darker, closer together, higher up, etc.) goes on the jogging path and sees other family mii-s out jogging. We see Oma out there all the time. I enjoy the yoga and balance stuff. And skiing and snowboarding. And you haven't lived until you've seen my husband virtual hula-hooping. I thought I would die laughing. 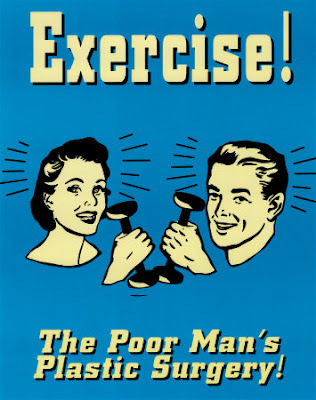 Which I think is also good exercise, right? Laughing? Some of the strength exercises are better than others, but my triceps are killing me today from the plank exercise. One of the clever things on the Fit is that as you exercise more, it unlocks more games and advanced levels of exercises. Often when you are ready to quit playing, you are motivated to see what your new yoga pose or strength exercise is. And then there you are, sucked in again. The biggest negative is the repetitive trainer advice. They say “do yoga every day to improve your posture” after every yoga exercise. I’ve taken to yelling at them to shut up. Very zen of me. Because the Fit measures your weight (and calculates your BMI), it can measure how much weight you are putting on your front leg during lunges, for example. By earning points for how well you balance and maintain your posture, you are ranked against other players in your family. Imagine the horror of being out-jogged by your 6 year old. Naturally you have to do another round to save your dignity. I am proud to report that I set up our Wii to connect to the Internet, so we can download games (some are free. All are cheap. ), see other people’s mii-s and participate in mii contests (make a mii for Ben Franklin or a goth girl were two recent contests), and theoretically play virtual tennis with our friends across the street. This is how you play tennis in a Midwestern winter! In your living room! Why, when I was a kid, you had to play tennis outdoors, in the rain, while getting sunburned and bee stung. Kids these days. So, my summarized review is that it won't replace actual cardio and weights, but it's a fun way to add some other exercise to your schedule. It’s easy to do 30 minutes without getting bored. If you are very athletic, it may not challenge you enough, but I really mean very athletic. If you have a significant amount of sloth to overcome, I can’t recommend this product highly enough. It’s certainly worth an extra $89, assuming you already own a Wii. There are also other Wii games that do NOT use the Fit balance board. I think I might get My Fitness Coach, based on the positive reviews. The kids might like Active Life Outdoor Challenge, too. Beats old-fashioned working out. Uphill. Both ways. Finally, your review in print. Now if I could only find one to purchase.